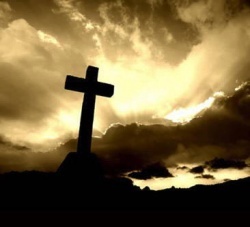 Jesus is the son of God. Around 7 BC, an angel told a virgin named Mary that she would give birth to a son, and call his name Jesus. On the night of his birth, angels announced his arrival to shepherds near Bethlehem. Shortly after that, an aged man named Simeon and a prophetess named Anna prophecied over the infant child Jesus. A brilliant star also appeared, and led wise men from the east to travel and worship Jesus. As a result of the wise men's story, King Herod had all the children in Bethlehem 2 years and under slaughtered. Joseph (who married the virgin Mary after the birth of Jesus) had been warned by an angel in a dream to leave Bethlehem and go to Egypt with Mary and the young child Jesus, and escaped Herod's slaughter. King Herod died in 4 BC, which places the birth of Jesus before that time - possibly in 6 BC. It was these teachings that turned the religious leaders against Jesus, who was falsely accused, humiliated, beaten, and finally crucified. Jesus was crucified on a Friday (the Jewish feast of Passover being celebrated on the preceding night) and his body was set in a tomb with soldiers placed in front to guard the tomb from his followers. On Sunday morning, the Angel of the Lord descended from Heaven in the sight of the guards, and rolled back the stone from the tomb. At that moment, Jesus of Nazareth proved that he was the Son of God when he raised from the dead. 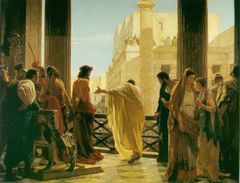 Pilate, the Roman Prefect of Judea who presided over part of Jesus' trial, came to power in 26 AD, which places the crucifixion after that time - possibly in 27 AD. The full life story and teachings of Jesus can be found in the Bible in the books of Matthew, Mark, Luke, and John.